For centuries, the humble salmon (Salmo salar) stood as a symbol of wisdom, held sacred by Celts, Picts, Druids, and numerous other cultures. They feature in the mythology of many nations, including the Irish and Welsh. In the Mabinogion, Welsh hero Culhwch is tasked with releasing Mabon, an imprisoned child. The animals they ask for help refer Culhwch and his gang on to increasingly more ancient creatures, until they reach the most ancient and wise of them all: the Salmon of Llyn Llyw. The Salmon knows where the child is, and gives the band of men a lift to Mabon on his back, to boot. It is not surprising the salmon of Llyn Llyw knew the way, as the species are famous for the gruelling aquatic odysseys they undertake annually to spawn. They are anadromous, which means they can live in both salt and freshwater, and, although they spend much of their adult lives at sea they return to gravelly river headwaters to breed. As if mastering two diverse ecosystems weren’t enough, they are also remarkable acrobats, travelling upstream, leaping up any waterfalls and weirs that stand between them and their goal. They can jump up to 3 metres, and here in Wales do not have to worry that they may be leaping into the jaws of a hungry grizzly bear! 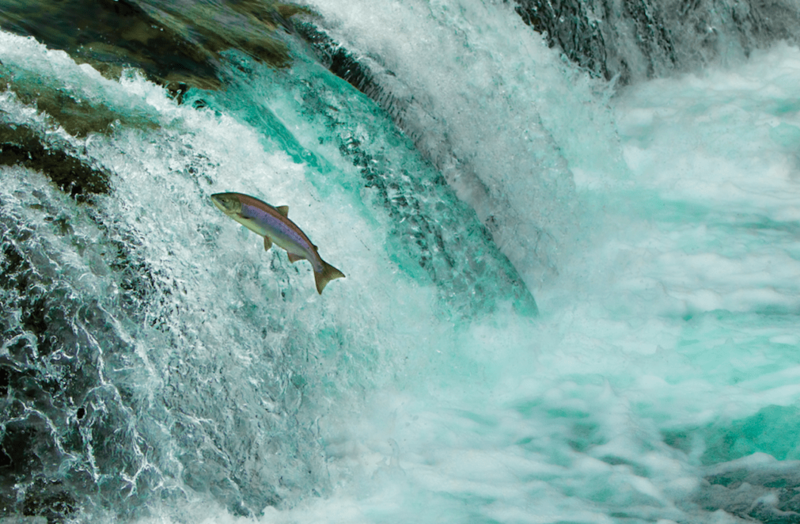 Most salmon return to the spot in which they hatched to spawn, often travelling hundreds of miles to do so. Their superlative navigating is thought to be done by using smell, and the Earth’s magnetic fields. What is truly amazing about this is that it means it is not an innately born instinct, but a learned behaviour. Humbling for those of us who rely on Satnav for even the most modest of journeys! Young salmon will spend around 4-6 years in rivers, before swimming downstream to reach the ocean. They migrate towards the ocean between March and June, after they have smoltified. Smoltifying is the term given to the physiological changes salmon go through in order to be able to live in saline water. After about a year at sea, salmon return between November and February to the mainland rivers to breed. Females dig depressions in the gravel with their tails, known as ‘redds’, before eggs and milt (sperm) are simultaneously released into the water and deposited in the redds, where they will hatch. Juvenile salmon feed on invertebrates, insects and plankton, and adult salmon will eat capelin. They can live for around seven years, although this is a rather unlikely occurrence as they have many predators at all stages of life. Their predators include: fish, birds, sharks, seals, bears, and of course, humans. They are under severe threat due to the human impacts on the species. Besides fishing, salmon levels are also affected by habitat loss and pollution, dams and water management. There are also problems related to salmon farms. The breeding of farm salmon with wild salmon causes adverse issues with the offspring; they are less well-adapted to the wild and less disease-resistant. Salmon are known as an indicator species, and in clean, well-manged river eco-systems, the salmon population is likely to be healthy, and vice-versa. Their plummeting numbers are undoubtedly cause for concern. Salmon are declining on a worldwide scale, including here in Wales. Only between 15-35% of eggs hatched will survive to the fry stage, and in some places as little as 5% of the salmon that swim out to sea ever return, a worrying statistic that indicates further extirpation from some rivers, and perhaps one day, if nothing is done, extinction. Last year Natural Resources Wales stated that the Welsh salmon population had hit an ‘unprecedented’ low. These are grim statistics, yet, these wise, gravity-defying, irrepressible creatures are surely a symbol of determination that can inspire us all in these troubled times, as we struggle against the current together, hoping we have the strength and wisdom to leap like a salmon over the obstacles that stand between us and a healthy, balanced planet.